The Daiquiri Deck Raw Bar is a chain of popular seafood restaurants/raw bars with locations on Siesta Key, St. Armands Key, and on the Island of Venice. Siesta Key Daiquiri Deck is right in Siesta Village and a quick walk from Tropical Breeze Resort at 5250 Ocean Blvd. This is the place to go if you are looking for things to do or a fun hangout spot with energetic live music, a lively crowd, casual but high quality seafood dining, and a fantastic happy hour with several unique drink and specials. The Daiquiri Deck isn’t just a go to spot for great drinks; you’ll also find a full range of amazingly prepared menu items there. The menu includes a huge delectable selection of surf and turf appetizers and entrees that patrons truly love. The “Snacketizers” menu alone includes everything from calamari, to nachos, to alligator bites and many other choices. For the health conscious, several wraps are available made with seafood, chicken, steak or veggies. Main entrees include many different steak, pizza, seafood, and pasta options with many customize-able options including your choice of meat or seafood. You can also choose from a selection of delicious seafood sandwiches and burgers if you’re craving a quick lunch or light dinner. The Daiquiri Deck is popular for its very high quality raw seafood bar and offers you the opportunity to try raw oysters from several different regions (when available) as well as cooked oysters, tuna, mussels, shrimp and clams. 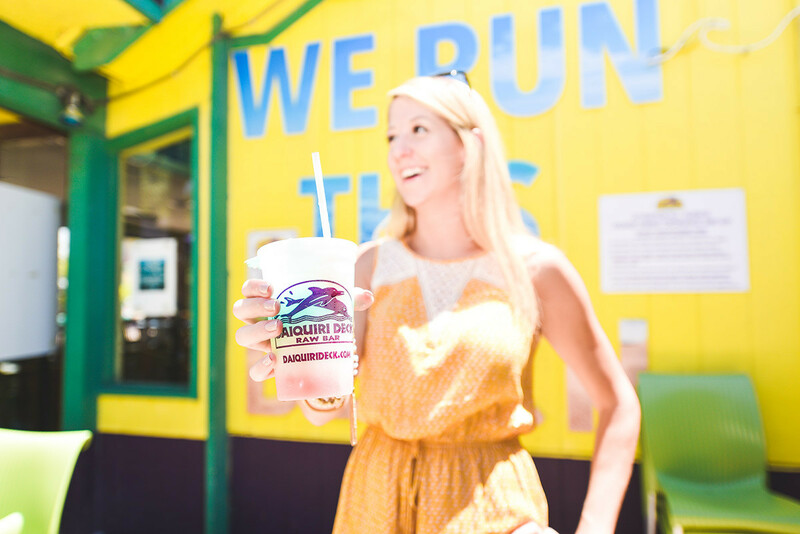 Just as the name implies, the Daiquiri Deck is the place to try some of the best frozen daiquiri on Siesta Key with specialties that you can only find there such as the “Mangorita” which is mixed with gold tequila, mango flavored Green Parrot and a margarita. Over 20 other combinations are also available with creative names like the “Voodoo Love Shake”, “Terminal Velocity” or “Grape Ape” and equally unique ingredients. Happy Hour starts at 3:00 p.m. and ends at 7:00 p.m. with discounts on well drinks, house wine, daiquiris, and domestic beers. There is also a seasonal rotation of extra drink specials that you can ask about once you are there or view on the website. The Daiquiri Deck is one of the top nightlife spots on Siesta Key as it is open from 11:00 a.m. until 2:00 a.m. every night of the week. You’ll be able to catch several different local or traveling bands and DJs playing there on any given night. There are also regular competitions, sporting events, and other special events that are frequently posted on the website. The Daiquiri Deck is just a short stroll from your Tropical Breeze Resort accommodations, so head there for a quick drink or daiquiri after a long day at the beach, or check out the live entertainment and try the delicious seafood that awaits you there!